Scheduled for Nov. 28–Dec. 9 in Durban, these businesses claim governments should attempt to create measures that ensure poorer nations will have $100 billion in climate aid annually by the year 2020, paving the way for more low-carbon investments. More than 175 companies are included in this statement, which also notes that major emitting nations must make larger efforts to cut their carbon emissions enough to make a decent dent in global warming. “If we do not act, climate change risks seriously undermining future global prosperity and inflicting significant social, economic and environmental costs on the world,” the companies said. The companies are also encouraging countries to create agreements for financial partnerships, as well as tackle problem areas such as deforestation and international shipping and aviation emissions. 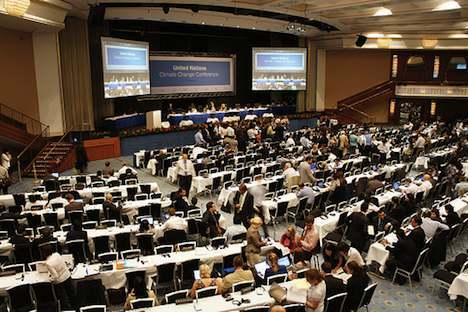 During climate talks in Panama City earlier this month, many veteran climate observers and negotiators said it seemed highly unlikely that any sort of binding deal would come from Durban. Investors and companies are still urging governments to adopt national policies rather than wait around for a global climate pact. In order to contain global warming within the limit of 2 degrees Celsius, scientists say carbon emissions will need to fall between 80 and 95 percent by 2050. In other words, time is running out, and it’s running out very quickly. Next post: Will The iPhone 4S Lead To Huge Amounts Of iWaste? What Can Be Done? Are Wood Products Better For The Environment Than Steel Or Concrete?